Ali Yanik, assistant professor of electrical and computer engineering in the Baskin School of Engineering, has received a Faculty Early Career Development (CAREER) Award from the National Science Foundation (NSF). The five-year, $500,000 grant will support Yanik's project to develop "phononic metamaterials"—artificial materials designed to control atomic-level acoustic vibrations—and investigate novel biomedical applications merging phononics with microfluidics. The work could lead to integrated “lab-on-chip” systems programmable to complete multiple tasks and achieve precise control of bioparticles (such as cells, bacteria, or exosomes) in a solution environment, Yanik said. Like electrons and photons, a phonon is a quasiparticle, a particle derived from collective vibrations of atoms in solids. The ability to control electrons and photons led to major breakthroughs, including inventions such as the transistor, computer, camera, laser, and fiber optics. Yanik and others believe that the ability to control and manipulate phonons in artificially created phononic materials could lead to similar revolutionary breakthroughs. “The idea behind my research is to use phononic metamaterials to push the boundaries of today’s acousto-microfluidic technologies beyond conventional standing-wave devices,” said Yanik, who laid the theoretical and experimental framework for the proposed research through a prior NSF award and has demonstrated practical uses of phononic metamaterials in microfluidics for the first time. Microfluidics is a relatively new technology in which a tiny volume of fluid moves through a microdevice. By applying a force to the fluid as it flows through the device, bioparticles within the fluid can be detected, separated, sorted, or isolated. One promising force is acoustic radiation force, which is non-invasive and non-harmful to cells. However, acoustic radiation has so far been limited to size-based bioparticle manipulation. In biomedical applications, it is often desirable to separate or isolate cells based on other characteristics, such as cell type or binding affinity. Because of the limitations of any one particular force or physical mechanism, multiple physical mechanisms are often required to achieve an overall objective. For example, one physical mechanism might detect a particular type of cell, while another mechanism separates larger cells from smaller cells, and yet another isolates and holds a particular cell type. This can result in fragmentation of on-chip technologies to multiple platforms and pose a fundamental bottleneck from a practical perspective, Yanik said. By creating a “toolkit” that offers a full set of diagnostic operations including sample processing, size- and affinity-based cell sorting, actuation, trapping, and detection, Yanik's research could “open the door to a new world of lab-on-chip biomedical technologies,” he said. A critical aspect of his research is that ionic-type phononic metamaterials offer a third degree of freedom (frequency) to conventional two-dimensional surface acoustic wave devices. This third dimension offers frequency-dependent characteristics and enables frequency-coded functionality. His research program aims to transform conventional surface acoustic (phononic) approaches from a “flatland” with limited design flexibility to a three-dimensional space that offers unprecedented level of control and flexibility in design and integration. In other words, with a 3-dimensional device such as the one Yanik proposes to develop, a single platform could be programmed to carry out multiple tasks, eliminating the need for multiple devices. “I want to understand the advantages and technical issues associated with phononic metamaterials, which will lead to a deeper insight into their unprecedented potential for more involved schemes of acoustofluidic particle manipulation for biomedical applications,” Yanik said. The CAREER awards are NSF’s most prestigious awards in support of early-career faculty who exemplify the role of teacher-scholars through outstanding research, excellent education, and the integration of education and research. 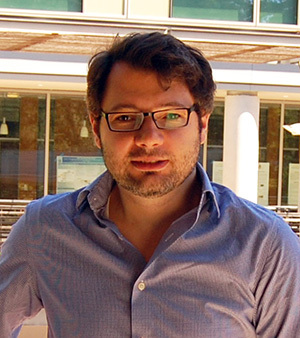 Yanik has made key contributions in the areas of biosensor and lab-on-a-chip development. His research focuses on nanoplasmonic biosensors for viral and bacterial pathogen detection, optofluidic bio-NEMS for disease diagnostics, rare cell isolation techniques, and nanophotonics and plasmonic device engineering. He received his Ph.D. degree in applied theoretical physics in 2007 from Purdue University and was a postdoctoral researcher at Harvard Medical School before coming to UC Santa Cruz.